Writing IFDs to disk requires a Houdini, Houdini FX, or Education, license. Indie files cannot generate IFDs. While apprentice users cannot generate IFDs directly, using these workflows can still improve your render times in some circumstances. For example, Mantra renders will start more quickly if you make the behind-the-scenes IFD faster to generate. When rendering with Mantra, Houdini writes the contents of your scene file to a scene description file which Mantra reads. This is the IFD file, which stand for Instantaneous Frame Description. Usually when you render with Mantra, you simply render, and Houdini does the work of generating an IFD and sending it to Mantra to render it to an image on disk. Not only can this process be lengthy and result in large IFD files (especially for complex and long shots), it consumes a Houdini or Houdini Engine (Houdini Batch) license. Financially, this is significant because a Full commercial license of Houdini comes with unlimited Mantra tokens. This means you can use as many machines as you have access to for rendering, while keeping your Houdini and Engine licenses free for working and running simulations. So being able to generate IFDs as fast as possible to render is very important. Leveraging light-weight IFDs is also significant from a pipeline perspective. Even if the animation department updates a performance, or the modelling department modifies a set, or a TD tweaks a simulation, you only need to update the IFD if the materials or lights change. Otherwise, Mantra will simply pick up any changes to the on-disk geometry the next time it renders the IFDs. Since version 14.0, Houdini supports Blosc-compressed IFDs. This is a convenient and very easy way to get smaller, but still fast, IFDs. Blosc compression is also supported by bgeo, vdb, rat. At the end of the HQueue and Rendering IFDs section, there is a comparison of .ifd vs .ifd.sc, so you can get an idea of the size differences. In Mantra rendering, a "procedural" is geometry generated at render-time by a special material. This means it’s not stored in the IFD file. An example of a procedural is a material used to render fur. The material uses a set of guide hairs help inform Mantra how and where to interpolate thousands more hairs than are currently in the scene file. Another kind of procedural references an external geometry file on disk when rendering. The best way to keep IFDs small is to reference external geometry or procedurally generating geometry using procedurals instead of baking geometry into the IFD file. While this example uses polygons, packed primitives, and Alembic caches, you can apply the same principles to volumetric geometry. Copy the ifd_workflows directory out of $HFS to somewhere in under you user directory so Houdini can write IFD files inside it. Houdini has some of the best support for Alembic caches in the industry, including fast and flexible Bullet solver support for packed primitives. Given this support, artists are creating more and more geometry in their workflows. Even motion graphics and set-dressing benefit from streamlined geometry formats. These formats are well suited to fast IFD workflows. Built from "live" geometry in a Houdini session. Packed Primitives streamed from a file on-disk. Are also built from "live" geometry. This section will use Packed Disk Primitives as an example, but you can also use Alembic primitives. We use Alembic in the section below on motion blur. You can often interchange Packed Primitives and Alembic primitives when working in Houdini; not always, but usually. This is because a Packed Primitive is a generalization of Alembic primitives, but can be made up of all types of geometry, including Alembic primitives. For more information, see the Packed Primitives page. Because Packed Disk Primitives by their nature are geometry streamed from a file, similar to Alembic primitives, we don’t have to use a special procedural to get smaller IFDs. In the example file, look inside the packed_pig Geometry Object. It contains a geometry network with a few nodes, all wired into a Copy SOP. If we look at the File SOP, it’s pointed to pig.bgeo.sc. To avoid duplicating our geometry on-disk, the File SOP offers the option to load the geometry as a Packed Disk Primitive; if you set the Load parameter to "Packed Disk Primitive", Houdini doesn’t load the Full Geometry and instead streams Pig from disk. If you render the mantra_pig_packed ROP and look at the IFD file, it’s only 15Kb! Even though we're copying our packed Pig to several points, and varying the color of each one, the IFD is still tiny. Using Packed Disk Primitives make uses less disk space and network IO. Material Stylesheets are extremely useful with on-disk geometry. Stylesheets let you assign and vary shaders without having to load the geometry and bind to it. See Material Stylesheets. In the network editor, go to /out, and look at our ROPs. We're using the Force Objects parameters to make sure each ROP only dumps a specific part of our scene into the IFD. 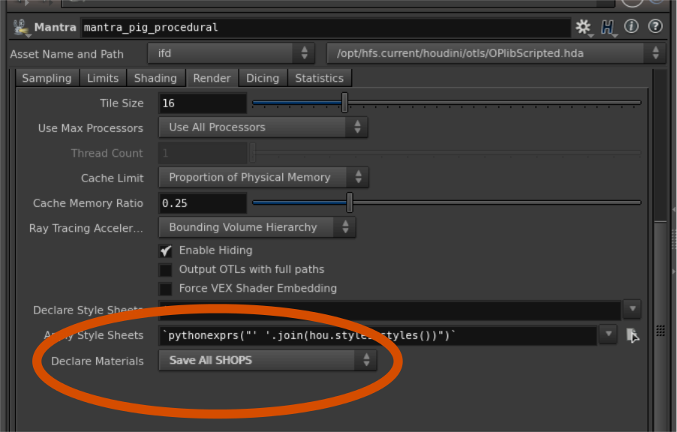 To make sure the IFDs get the materials, each ROP has Declare materials (on the __Render > Render_) tab set to "All SHOPs". Since the geometry only references a material but doesn’t include it, we need that material to be included in the IFD. Declaring all SHOPs forces all materials to be included in the IFD, so they are available for any procedurals to use. You’ll notice neither pig or procedural_pig have a material assigned at the Object level or at SOP level. Both have an attribute called shop_materialpath. As long as the current hip file has a material that matches that attribute, and we declare the materials on the ROP, everything will render. On the mantra_pig_packed ROP, go to Driver tab. The Disk file checkbox is on. If you click Render to Disk, nothing will appear to happen, but the ROP will generate an IFD file (instead of generating a temporary IFD file and automatically rendering it). Render IFDs for both mantra_pig and mantra_pig_packed. Note how much faster the procedural ROP runs. The benefits are obvious: the IFD file that references packed geometry instead of including it is 0.2% the size, and you don’t have to regenerate the IFD if the geometry file changes. Imagine you're rendering a shot with hundreds of gigabytes in cars, windows, and other props. In a shot that’s 600 frames long. A shot accessed by many computers at once. You can see why a studio would prefer to work this way. Even to a lone artist, or a school with more modest resources, saving disk space, and using Mantra tokens instead of Houdini licenses, are huge wins. Another method for importing external geometry at render time is the Delayed Load Procedural. The Delayed Load Procedural is a shader that fetches an object’s renderable geometry from disk at render time, replacing whatever geometry was inside the object (meaning the object can be empty, or contain simple proxy geometry). This workflow is largely obsoleted by Alembic files and packed primitives. In the future, the Geometry Procedural process may change significantly, or no long exist. In the example file, there is a Geometry object called pig and one called procedural_pig. If you hold on each node, you’ll see that pig has 1 child SOP (a File SOP pointing to $HIP/geo/pig.bgeo.sc), and procedural_pig has no child nodes. Select the procedural_pig node. In the parameters, click the Render ▸ Geometry tab. A parameter called Procedural Shader points to a Delayed Load procedural. If you jump to that node, you’ll see that its File parameter points to the pig.bgeo.sc file on disk. If you click the Render View, and set the ROP to mantra_pig_procedural, you’ll see our pig statue render. You can even render mantra_pig, to visually compare. Motion blur requires Mantra to capture models over an interval of time, thus requiring the geometry at the current frame, and also geometry from at least one other point in time. If you're including the geometry in the IFD file, this will balloon the size of the IFD even more. Yikes! This example will show how referencing external Alembic animation caches allows us to use motion blur while keeping the IFD small. Open the example .hip file, and select the object called alembic_bear. The object itself is pretty simple, with only a plastic material. Inside, an Alembic SOP points to the external Alembic file. This is very similar to what we did with Packed Primitives in the previous section. Navigate to the /out network, and select the ROP called mantra_alembic_bear. On the Rendering tab, Geo Time Samples is set to 2. Because we're using an external Alembic cache, this parameter tells Mantra to sample the same cache at two different points in time, but it doesn’t have to copy the geometry to the IFD. If you render this node, the bear has proper motion blur. You can compare this to the other motion-blur ROPs that don’t reference external files: mantra_bgeo_bear and mantra_bear_vel. The mantra_bgeo_bear node is simply rendering bgeo geometry, thus for each Geo Time Sample, a copy of the geometry is included in the IFD. The mantra_bear_vel nbode also uses BGEOs, but has velocity baked to the points as the v attribute. Because the bear only has 626 points, the differences aren’t as dramatic as with the Pig IFDs. But you can still see a significant advantage to using the Alembic cache. And as the geometry gets more complex, the advantage only gets bigger. If you have access to multiple machines, HQueue lets you simulate and render across multiple computers. HQueue has built-in support for using a dedicated machine (or group of machines) to generate IFDs, while others render the IFDs directly. This means Houdini/Engine licenses are only needed by the IFD generators. The rest will use Mantra render tokens. And now that you're using external geometry to optimize your IFDs, the generation part is very fast and doesn’t require a large a number of machines. To render the HQueue examples below, you must first set up an HQueue farm and change HQueue Server parameter to the server on your network. You’ll also need to set Target HFS to the $HFS value your clients are configured for. If you don’t have HQueue set up, check out the links to HQueue documentation at the end of this section. The mantra_bear_alembic_hq ROP is identical to mantra_bear_alembic, except it’s set to render a Frame Range, and the Disk file checkbox on the Driver tab is off. The mantra_bear_alembic_hq is wired to an HQueue Render node. On the Hqueue node’s Mantra Options tab, the Generate IFDs parameter is on, with an output path relative to $HIP. We've also changed Assign IFD Job To from generating on the rendering client to be "Clients from Listed Groups". In this example, the group of IFD-generating machines is called ifd-maker. On the Advanced tab, we assign the render jobs to "Clients from Listed Groups", but here we specify the group ifd-render. So clients in the the ifd-render group will render the IFDs as they are generated by the clients in the ifd-maker group. If you render this node and open your HQueue Dashboard, there is a single job called Generate IFDs, and the rest are of the nodes are rendering. And if you want, take a look at your license manager; you’ll see that none of these machines are using a Houdini or Houdini-Engine license; they're all using Render tokens.